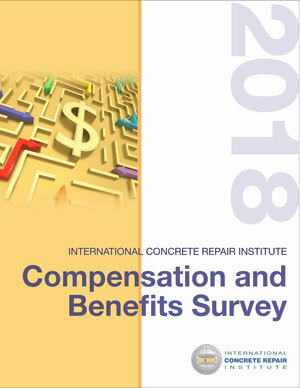 ICRI Compensation & Benefits Survey 2018 - International Concrete Repair Institute, Inc. This is the first time compensation and benefits have been studied for the concrete repair industry. Earl Lucas | President, Robert E. Porter Construction Company, Inc.
Why did ICRI perform a Compensation Survey? Of the 3,308 firms contacted, 321 responded to the survey, (9.9%). Most respondents (81%) have their headquarters in the United States while 13% are in Canada and 6% in other countries. To receive the ICRI member pricing, you must be logged into the ICRI website.